Come every Saturday, we like to bring the kids out and spend quality time bonding as a family. Considering the size of Singapore and our unwillingness to spend a bomb, the hubby and I usually rack our brains over where to go or what to do. 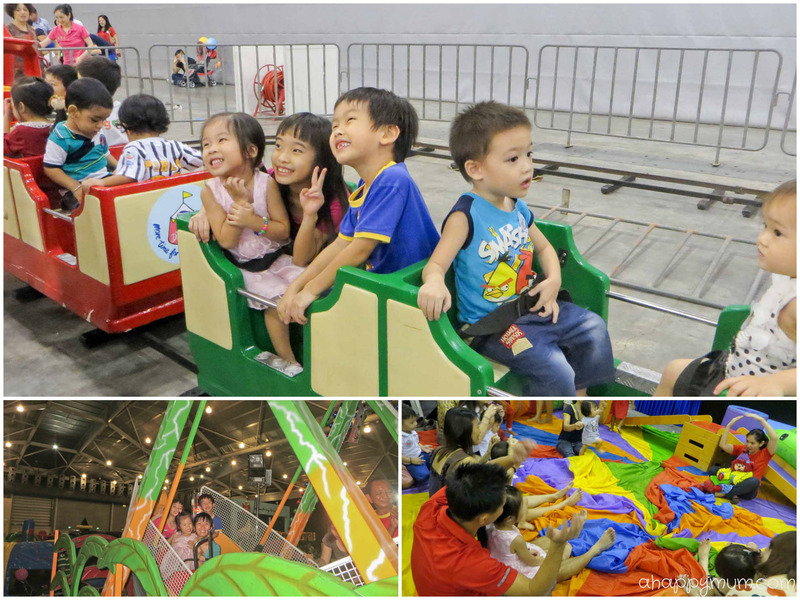 Now, what would you say to a day of fun activities, complete with lucky draws, storytelling sessions and kiddy rides, plus the fact that it is free? Yippee! Yes, that's right. We were thankful to be able to attend the Drypers Little Day Out carnival which was held recently and designed to ensure that the whole family had fun together. 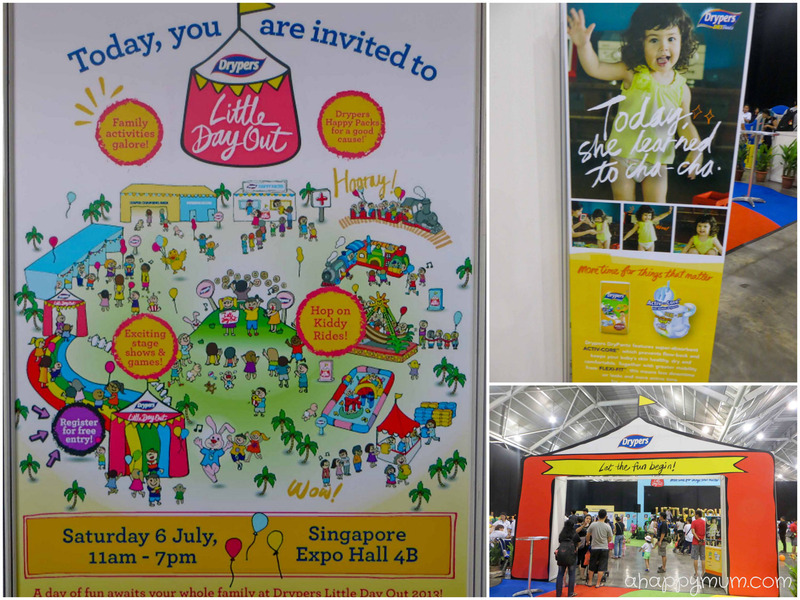 Considering the fear of haze and the fact that it is either scorching hot or drizzling in the afternoons, I was glad to know that the event was held indoors in the Singapore Expo hall. 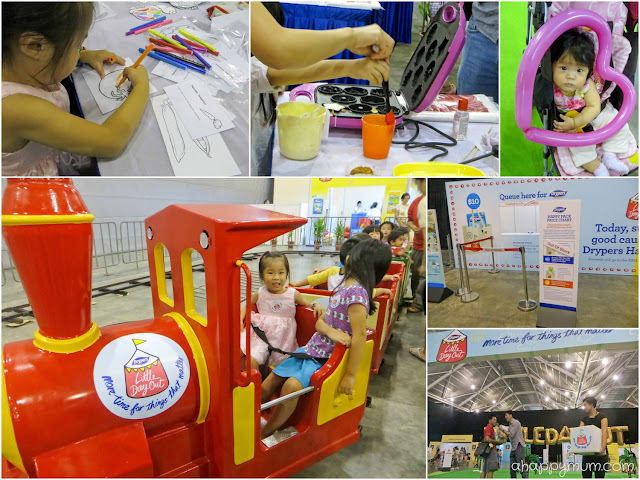 Although the place looked limited and the activities did not seem overwhelming at first glance, we came to discover that the kids could end up spending hours of fun and the event was truly more than meets the eye. 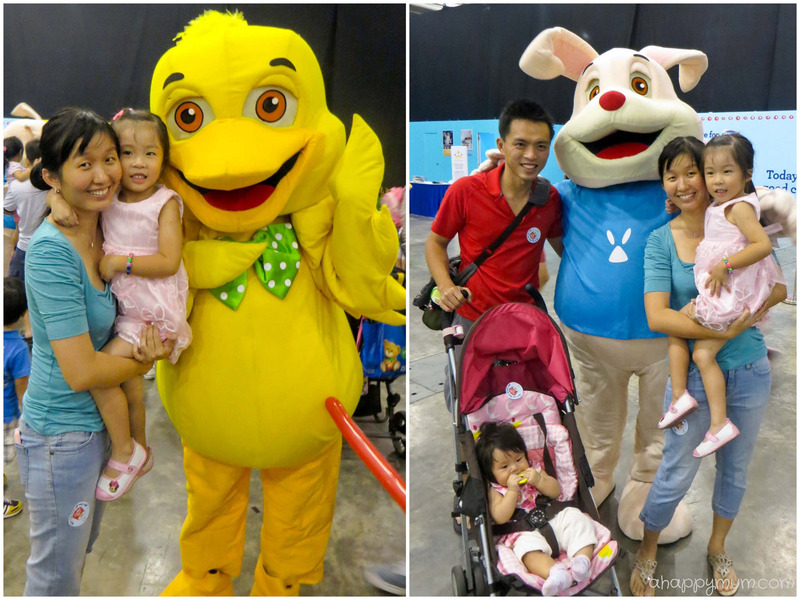 We came up close with the mascots of the day. While Angel was a little afraid and didn't dare to take pictures with them on her own, she then scrutinised them from head to toe and came telling me "Mummy, look! I see legs! Got somebody inside, not real!" The Drypers Little Day Out comprised of an array of activities catered for kids of all ages, including bouncy castles, storytelling sessions by Creative Ark, baby and toddler play zones, gym and music sessions, Choo Choo train and Pirate Ship rides, art and craft sessions and baking activities. Special Drypers Wee Wee Dry and DryPantz Happy Packs were also on sale at the event on a first-come, first-served basis and all proceeds went to the KKH Health Endowment Fund. These sold like hot cakes and by the time we reached in the early afternoon, the Wee Wee Dry Happy Packs already ran out of stock. Angel came asking me "Mummy, where is our goodie bag?" (yes, she is a mum blogger's kid) and I was going to tell her we couldn't get one when I heard the hubby's name being announced on stage. It came as a pleasant surprise to know that he was picked as one of the lucky draw winners, the first time that he had won! Yay to more Drypers baby toiletries in the house! As simple as some of the activities might be, my girl rolled in laughter on the bouncy castles, coloured a rainbow tomato, drove a train and smiled like she was on top of the world. While the hubby took care of Ariel, I spent that few hours bonding with my first child, talking to her, holding her hand, listening to stories with her and realising how she has grown since a baby into the independent girl she is now. In fact, believe it or not, we bumped into her cousins and she went on top of the world, again. Yes, more train rides, more castle jumping, more photo taking, more freestyle dancing and she even took a bold step and went onto the Pirate Ship ride. Even though the Viking has never been my favourite ride, I was in the mood for some mother-daughter fun and so we went on it together. That was the most exhilarating ride of the day as we got to experience that free fall feeling and let's just say I was glad that the kids and I made it through with big smiles. And high-pitched screams. As for baby Ariel, even though she could only watch and couldn't join in much of the fun activities yet, she got to enjoy that comfortable diaper changing station, try on the Drypers DryPantz samples and take home a heart shaped balloon sculpture from the event. 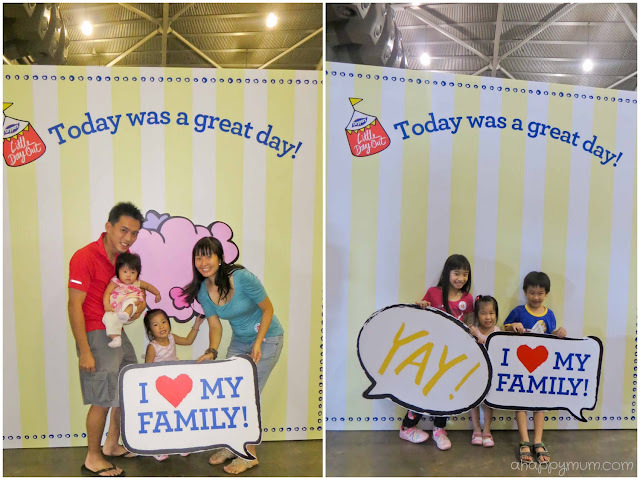 Last but not least, my favourite corner was the photo-taking booth where we could take a family shot and keep the print outs. There were also props like die cut pictures and speech bubbles for us to choose from. I chose the one that spoke my feelings best - "I love my family". Yes I do, beyond words can say. Many thanks to Drypers for organising the Little Day Out and giving my family a great opportunity to laugh, to play and to bond. 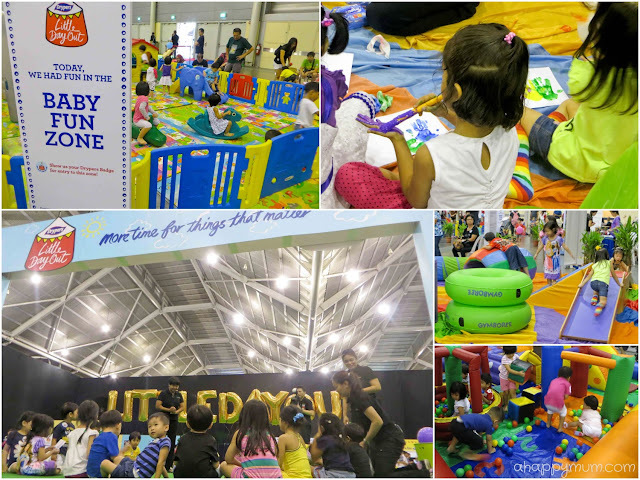 Disclosure: This is part of a series of sponsored conversations between Drypers Singapore and A Happy Mum. All opinions and text are my own.